I’m phenomenal in the courtroom. I’m even better in the bedroom. I guarantee clients the best result possible. I guarantee women a night they will never forget. I always keep my promises. Women get one night with me and that’s it. Then April comes along and turns everything on its head. Now I’m her boss, and if she thinks she’s going to get off lightly, she’s going to be in for a big, thick, throbbing surprise. Life as a law student is tough enough, without having to deal with people like Foster Arrington. He caught me at a vulnerable moment. That’s my excuse and I’m sticking to it. I’m sensible enough to know better, but his muscles, tattoos, and predication to violence are impossible to resist. Now I have to work with him. And he’s going to be my stepbrother. He hits on me all the time, but that’s not the problem. The problem is I think I like it. A lot. 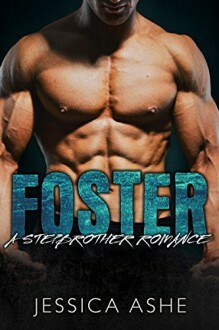 Foster is a standalone novel with a HEA and no cliffhangers.